Speed. Stability. Savings. These are three powerful reasons to choose the roll forming method to produce all structural components for mounting solar support systems. Plus, Roller Die’s strong and durable mounting hardware is manufactured using sound engineering principles. Power the future with Roller Die, creating custom-designed solar panel solutions that far exceed new industry standards. This "solar carport" covers parked vehicles and has a roof comprised of solar panels. Photo 1 of 2. 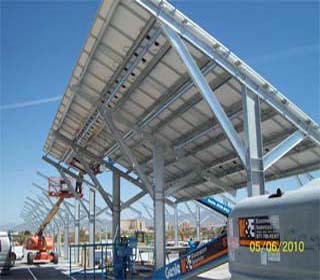 Location: Las Vegas Desert, NV Roller Die produced the steel components used to build this structure. This "solar carport" covers parked vehicles and has a roof comprised of solar panels. Photo 2 of 2. Location: Las Vegas Desert, NV Roller Die produced the steel components used to build this structure. 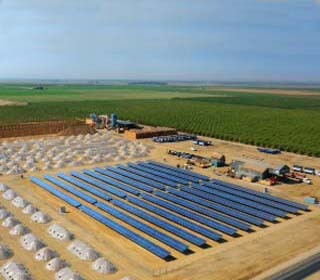 787 kW Single Axis tracking PV system Location: Bakersfield, CA 20,200ft of roll formed product used. 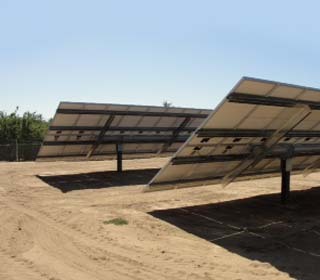 Two 36.4 kW trackers in rear view Location: Modesto, CA Single Axis tracking creates 28% more energy than fixed systems. 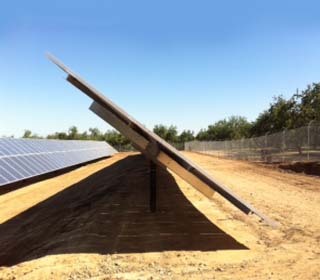 Two 36.4 kW trackers in side view Location: Modesto, CA 1820ft of roll formed product used. As solar power thrives, so does Roller Die. Fast becoming a leader in the solar mounting industry, we’ve adapted 40 years of structural manufacturing experience to solar projects across North America. Secondary operations like hole punching, painting and finishing are all included in your quote! 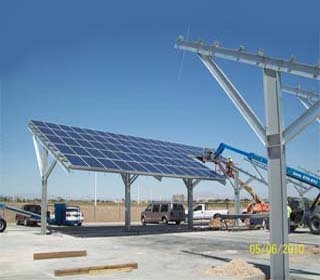 Ensure your solar panel ground mount lasts as long as the sun, with Roller Die. For a FREE quote on your solar panel mounting solution, call us at 502-969-1327 or fill out the form on this page.